After the $29.50 crew neck shirt showed up on the retailer’s Instagram this week, it sold out online, but not before some commenters made clear they were not cool with indoctrinating children in this way. Defenders noted that boys have long been sold and marketed message T-shirts that perpetuate sexism, and this shirt is doing the opposite: “Messages like ‘chick magnet,’ ‘boys will be boys,’ ‘fathers, lock up your daughters,’ and ‘ladies’ man’ cultivate and perpetuate an attitude of disrespect toward and objectification of women. It’s not ok,” another wrote. On Twitter others made the same observation — that no one seemed to mind when J.Crew sold a “lock up your daughters” T-shirt for boys. This isn’t the first time this has come up. 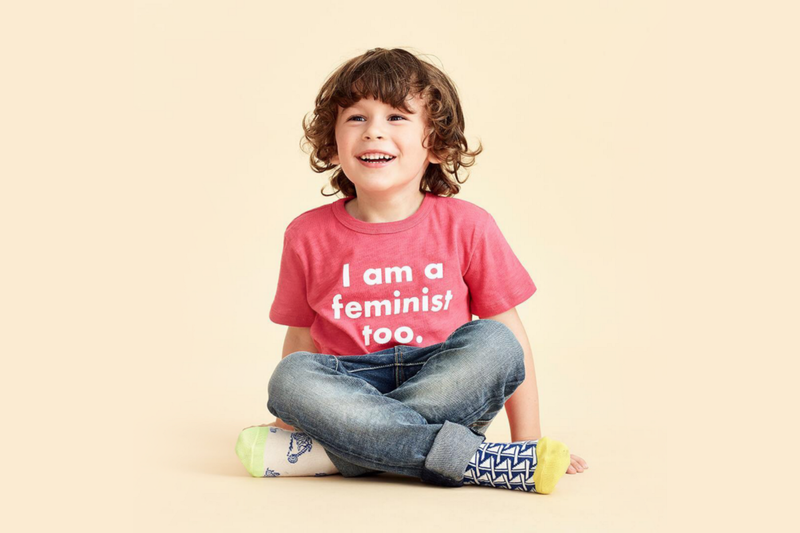 A few years ago, retailer Zulily sold a line of positively messaged shirts for boys and girls, but notably, a Boys Will Be Boys T-shirt with the Boys crossed out and replaced in red letters with Feminist. Folks got just as upset, arguing the messages on the shirts promoting girls as strong and capable were “unfair” to boys and this whole feminism thing had gone too far. On the J.Crew Instagram, the comments quickly got political, and while no one said outright that they didn’t believe men and women were equal, most of them took issue with the use of the word feminist or the indoctrination of children with ideologies they are too young to understand. That devolved into another round of debating whether today’s use of the word “feminist” is misandrist or not. Those opposed to the shirt clearly still attach negativity to its use. Retailer Free to Be Kids also makes social justice themed T-shirts for boys and girls, including feminist themed ones. My own Kindergarten son’s definition of feminism is simply that “girls should be allowed to do the same things as boys.” One day when he heard other kids on the playground say that girls weren’t allowed to play soccer with the boys, he not only raised it with his teachers — he actually stood up at an all-school meeting in front of more than 100 kids to state that girls should be able to do the same things as boys, then call on his friends for comments and discussion. Pride does not begin to describe what I felt when I heard about this. But they maintain that equality should be a fact of life, not a polarizing term, and they aren’t the only retailers who have begun to pick up on this shift in embracing the term and the messages associated with it. A number of brands are not only offering gender inclusive or gender neutral clothing that can be worn by girls or boys, particularly for children under age 2. Retailers have also begun removing some of the gendered labeling of toys in the toy aisle — Target did so in 2015. And the haters obviously aren’t the market for the social justice T-shirts. Mintel market research found that one in five parents with a child under age 12 wants gender neutral clothing and products, particularly Millennial and Gen Z parents, who aren’t fans of gender segregation in shopping. Like so many aspects of our gender identity, gendered clothing was also a marketing ploy. In a piece looking at the changing trends and history of gendered kids stuff at Footwear News, we learn that it wasn’t actually so pervasive until the 1980s, when two important things happened: increased use of prenatal testing to determine gender of unborn children, and the advertising realization, to multiply sales, that parents would buy two of everything if it was distinguished by gender. That led to, according to historian and author Jo B. Paoletti, who researches fashion gender differences, an “explosion” in hyper-gendered gear and clothes. Of course, the clothes do matter. But they are only one part of the real indoctrination of gender going on. Raising a feminist son takes a lot more than sticking them in a T-shirt that advertises it. It’s good branding for the cause, and money in a retailer’s pocket, but what will it do for your kid? In a piece at the New York Times seeking advice from a range of experts on how to raise a feminist son, Claire Cain Miller devised the following: let him cry, give him female role models, let him be himself, teach him to cook and clean, to nurture others, to be pals with girls, teach consent, teach him that “girl” isn’t an insult, read books about girls and women, and celebrate boyhood, too. There’s nothing in there about putting him in a T-shirt. But if you’re going to, you might want to at least make sure you’ve explained what it means, if for no other reason than so they can debate everyone who will have a problem with it.